The TWU-IAM Association commenced joint contract negotiations for approximately 30,000 ground workers including fleet service, mechanic and related/stores employees at American Airlines on December 3, 2015. These negotiations will lead to an historic, industry-leading contract and are progressing at a pace never before seen in the history of the TWU or IAM. The negotiating committees depend on the support of each and every member back home. Please see the most recent updates from your Negotiations Committee below. To read the full post simply click on the post title. The TWU’s informational picketing in TUL has received a great amount of news coverage. See the links below for the stories and videos and the photos of our brothers and sisters who are fighting to preserve our jobs!! The joint Alaska Airlines Negotiating Committee opened negotiations with Alaska Airlines management April 16-17,2019, in Seattle, Washington. Represented by the Company were: Shane Tackett, Executive Vice President/Strategic Planning; Jenny Wetzel, Vice President/Labor; Wayne Newton, Vice President/AOCS; Jason Berry, Managing Director/Cargo; Jeanne Davis, Director/Call Centers; Bob Hartnett, Director/Labor; Denise Kliskey, COPS Labor Manager; Rebecca Meissner, Senior Attorney; and Melinda Maher, Division Controller. 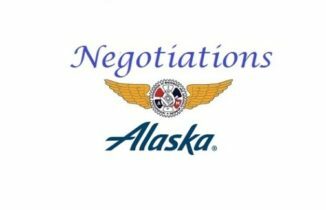 Joining your Negotiating Committee were: James Carlson, Assistant Airline Coordinator; Kris Hannah, Grand Lodge Representative; and Brianna Gregory, Grand Lodge Representative. Please watch and share the video below. Informational picketing sessions were held Thursday, March 28, 2019 at Charlotte Douglas International Airport. 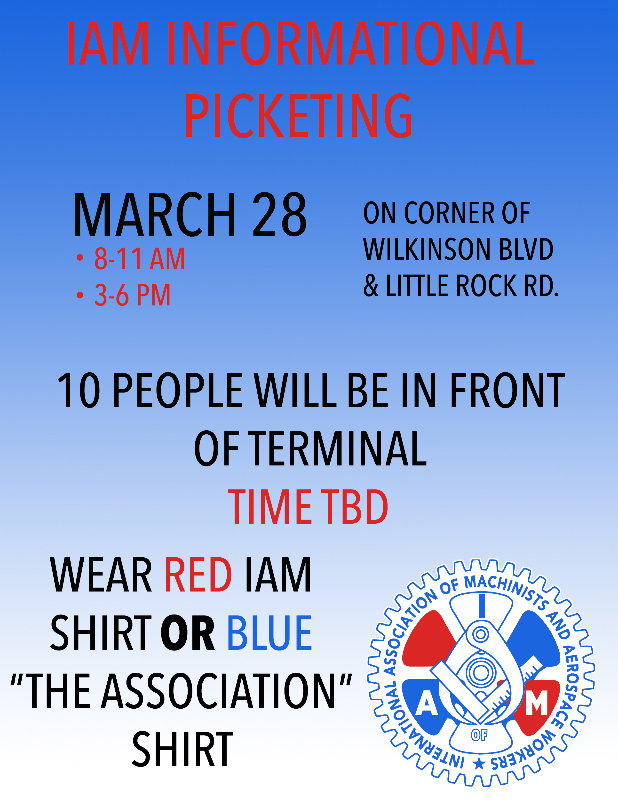 Association members from IAM Victory Lodge 1725, along with General Chairs from District Lodges 142 and 141 and TWU members from around the country picketed at the Departures area of the airport terminal and the entrance to the airport at Little Rock Rd and Wilkinson Blvd. If American Airlines wants to throw down their version of facts from two people who have never participated in a negotiating session, that’s their prerogative, we’ll throw down the real facts from those who were actually there. 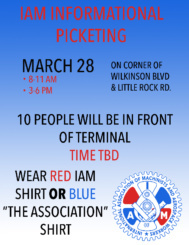 Informational Picketing will consist of 10 people maximum at the Charlotte airport terminal and unlimited number at the entrance to the airport on the corner of Wilkinson Blvd and Little Rock Rd. Times will be 8 – 11 AM and 3 – 6 PM. Please wear a red IAM shirt or a blue Association shirt. Download/print the flyer for all the details. All volunteers needed! The joint Alaska Airlines Negotiating Committee opened negotiations with Alaska Airlines management March 12-14, 2019, in Seattle, Washington. Represented by the Company were: Shane Tackett, Executive Vice President/Strategic Planning; Wayne Newton, Vice President/AOCS; Jason Berry, Managing Director/Cargo; Jeanne Davis, Director/Call Centers; Denise Kliskey, COPS Labor Manager; Rebecca Meissner, Senior Attorney; and Melinda Maher, Division Controller. Joining the Company was the new Vice President of Labor, Jenny Wetzel. We welcome Jenny to Alaska Airlines, and look forward to working with her. 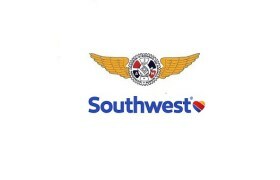 Negotiations continued the week of March 4, 2019, at Southwest Airlines Headquarters Dallas, Texas. Your Negotiation Committee started the week with continued work on open issues. Extensive dialog took place with the Company regarding Article Seven (Overtime) with a focus on Customer Service Agent Overtime. The scheduled upcoming session is April 15 -17, 2019 in Dallas, Texas. Please go to our website – www.iamdl142.org and sign up for email updates to get the latest updates on negotiations. Your continued support and solidarity is appreciated.